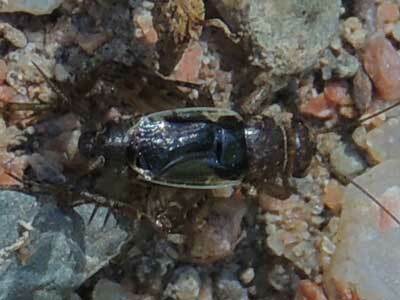 Arizona Naturalist >>> Sycamore Gallery Arthropods >>> Orthoptera >>> Neonemobius sp. Found beneath a rock on moist soil in a riparian canyon. Red Creek, Yavapai Co., Arizona, USA. 9 May 2016. This is a female and the specimen at right is the male. 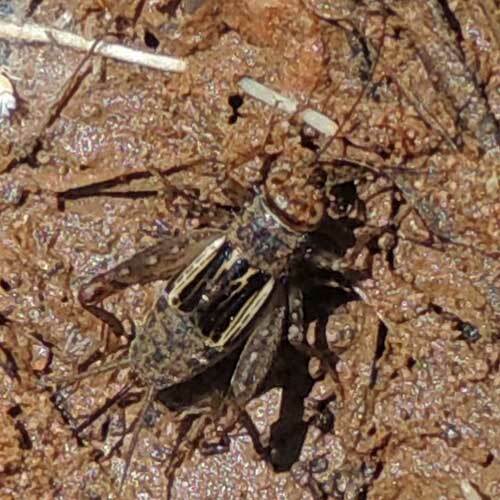 These small crickets spend much of their time concealed beneath the soil surface within tunnels or cavities left by burrowing creatures. As omnivores they feed on most any nutritious organic material they find such as leaves, fungi, fruits or dead arthropods. Adult males can sing using their wings like a violin with the purpose of attracting a female. The quality and amplitude of the sound may be a measure of fitness the females can judge.